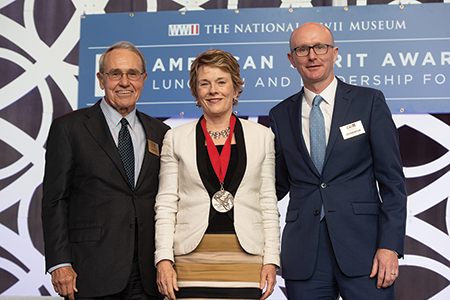 Alumna Adair Margo ’83 is one of three recipients of the 2018 American Spirit Medallion awarded in June by the National WWII Museum. Bestowed upon individuals who, through their work and philanthropy, exemplify the highest standards of integrity, discipline and initiative, the American Spirit Medallion also recognizes the individual’s unselfish contributions to their community, state or nation. Margo was recognized for her tireless work to promote and preserve the legacy of Tom Lea, an El Paso artist whose work conveyed his memories and visions of the battles and campaigns of World War II. Margo, who is currently the First Lady of El Paso, Texas, has spent her career advocating for the arts and championing their significance in helping build relationships within and across multiple cultures throughout the region. Adair Margo (center) received the 2018 American Spirit Medallion for her work safeguarding the legacy of Tom Lea, an El Paso artist. She is pictured with James Courter (left), immediate past chairman of the board, and Stephen J. Watson, president and CEO at the Museum. 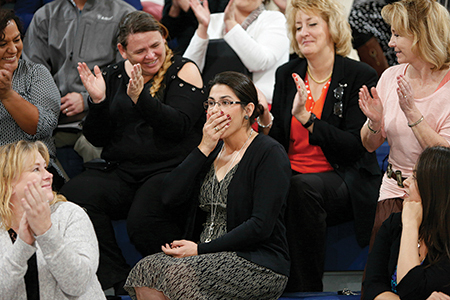 Math teacher Melanie Alfaro was surprised to receive New Mexico’s 2017-18 Milken Educator Award. She won a $25,000 prize for her work inspiring her students and helping to improve their math skills. Since 1987, the Milken Family Foundation has honored early to mid-career teaching professionals across the country for their achievements and their ability to inspire students to achieve more in the future. Alfaro, a former Aggie basketball player and member of the Athletics Department Hall of Fame, is a sixth-grade math teacher at Deming Intermediate School. She received the award in recognition of her efforts to improve math literacy. Deming has jumped two letter grades and 16 percentage points in end-of-year math assessments in the past few years, and Alfaro’s students lead the sixth grade in math proficiency. 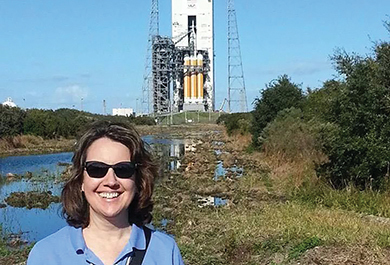 When Beth DeLucia Schulze was in high school, she wanted to be an astronaut and visit the moon. Today, she’s part of a team at Lockheed Martin who is assisting NASA with its Moon to Mars directive to send astronauts to Mars, starting with missions around the moon. Schulze, who graduated from NMSU in 1984 with a degree in physics, is a software systems engineering manager at Lockheed Martin Space, specifically for the Orion spacecraft – the world’s only deep-space, crew vehicle. Orion is also a part of Lockheed Martin’s Mars Base Camp concept, which once in orbit around Mars, could provide astronauts with a home away from Earth and a platform for conducting critical Mars science and landing site selections. Schulze and her team are responsible for Orion’s software systems. Scheduled for an un-crewed launch in 2020, Orion will travel beyond the moon and back and usher in a new era of space exploration. Beth DeLucia Schulze will soon help send astronauts to Mars as part of Lockheed Martin’s work with NASA and the Orion spacecraft – the world’s only deep-space, crew vehicle.